They say that if you’re not living on the edge, you are taking up too much space. A couple of weeks ago I was told that I was no longer needed in my job. I am currently in job transition since then and I really don’t know what is going to happen next in my life. When I was told that there was no more need for my services, I responded with excitement and enthusiasm (internally), because honestly my heart wasn’t really in that job. I could not see myself there in the long-term. The job was not making a statement of who I am. Within two days of being told that there was no more work for me, I booked a 5 – 6 week trip to Spain to do the Camino de Santiago. For the last couple of years, I have wanted to do this 800km pilgrimage walk however I have never been able to “fit it in” because of various life commitments. At the moment I am free and single and feel there is no better time to do it…..
A lot of us, myself included feel that we are going to live forever and we can have the tendency to go to the place of procrastinating about making a decision of really going for what we want in life. For me this decision is saying a loud YES to what I want to do at this phase in my life and not what I should do. A part of me is a little nervous about this journey however a big part of me is really excited. I have been reading and talking to people about this walk and it seems it is very much an inner and an outer journey. ~ To connect more to my higher purpose and a deeper part of myself. ~ To have more clarity on what inspires me and to have the capacity to live my passion. ~ To love and trust myself. ~ To trust my intuitive sense. ~ To be present to where I am. ~ To have fun and enjoy myself. ~ To be open to what ever happens and let go of any expectations. ~ To connect with people in a real and authentic way. ~ To enjoy the journey not just the destination. ~ I would also like to walk in silence for about an hour or more every day. At the moment I don’t know what the future beholds after this journey to Spain however a part of me is trusting that I will be shown the way. Hope all is well. And thank you for sharing your truth! Inspiring… our lives take many turns, and it is up to us to live them fully. This is a perfect example of something I talk about regularly which I call the flow. These events are so important to the human experience. Sometimes it takes events we cannot control to do proper introspection and really change our lives for the better. Hi Jonathan. Thanks for sharing your words of wisdom and inspiration. Sorry about losing your job, but as the old saying goes, when one door closes, another opens. Keep your positive attitude and what ever the universe has in store for you will show itself, and you will be able to recognize it. I always look at these times as lessons and opportunities. In 2002 I left a lucrative job an moved across 5 states to take a more lucrative one, only to get there and be unhappy. I was let go after five months. I realize now that I was there to discover a serious health issue and had I not been there, it more than likely would not be discovered and I am told I would be dead. When I moved back to NY, I landed the best job I ever and have been in it err since. And maybe you were let go to afford you the opportunity to take this pilgrimage to find something about yourself you would never have discovered otherwise. Good luck and have a wonderful “vacation”! Enjoy it for all it’s worth. Best of luck for your journey. I hope you have a really meaningful and exciting time! Looking forward to being a part of your journey! Awesome! I look forward to reading about it on your blog. Be blessed on your journey. This is such a good post. So many people struggle with job losses and other difficulties but you offer to all of us in this exquisite post a way to move on. You project a strong sense of self and an openness to whatever comes. Your pilgrimage sounds so life affirming. How wonderful for you! I love the quote. I hope you will post a few things while you are gone to keep us in touch with the exciting things you will be doing! Peace and safety for your journey. Good for you for taking on this adventure! Truly inspiring and so exciting! I can’t wait to read about this experience. Best of luck to you! Do share your experiences of this journey. This is so great, what a way to turn a potentially negative event in your life into the opportunity for an amazing experience! 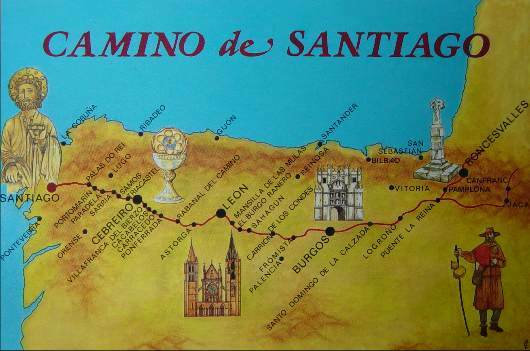 Doing the Camino has been on my list for some time now as well, I am hoping to make the journey in the next year or so. I am looking forward to hearing about the trip. Few things in life are more satisfying that leaving a not-quite-right job. Congratulations! May your pilgrimage be a voyage of discovery. Look forward to reading about your experiences. I am so incredibly excitied for you! I’m sure you will know exactly what to do when your journey is over and it will be better than you can even imagine. I can’t wait to follow you on it. I left my ‘proper’ job in January to develop my passion for yoga teaching and have found many doors opening. I love your quote from Coehlo. What a beautiful journey you are on! So often we feel that something has been taken from us when unexpected change comes. I tend to believe that all that is taken has first been given… whether consciously or unconsciously… we are the creators of our lives and our intentions are far more powerful than we can imagine. Without a doubt… your feet will take you places your heart beckons you towards! Thank you for sharing and for your kind and inspiring words. This is full of wisdom, TW. You will undoubtedly be endowed with such insight and joy that you’ll have courage to tackle much more than you could ask or imagine. What a delight – to be off on a trip of a lifetime – in more ways than one. Sorry to hear you lost your job. I am glad to hear that you are in a position financially to brush it off and take a trip. There is always another job, but there may not always be an opportunity to take this trip. My suggestion to you on your pilgrimage is push yourself outwardly and let God push you inwardly. Looking forward to hearing about your trip, and if you could share some your internal insights along the way, we will all be truly blessed, even as God as blessed you. Thanks for sharing your encouraging words! Oh WOW! i am so inspired and excited for you! I look forward to your insightful reflections as you share your experiences. Take Care! Hi, Wow I have read alot about this journey and it is onee of the things on my list to do. I am not very fit but hope one day I will be able to do it. You must if you haven’t already read Shirley Mc Clianes book on this it is amazing. If it is all it supposed to be it is a journey that will change you deeply. I look forward to reading all about it, good luck I am rooting for you. Remember when you face the stray pack of dogs to show no fear. Read the book it will explain all, maybe you will meet someone along the way. I am excited for you! You are having a life alteration and it will be fabulous because you say it is. Stay present as much as possible and please do report of your travels along the way. Good luck with your journey. There is an amusing travel book called Spanish Steps by Tim Moore who made the same trip with a donkey. You may find a few laughs in it. Great inspiration and a serendipity. You might want to read “Walking in Grace” by Atman which I edited a few years ago. Book is on amazon.com. Atman walked this journey when in her early 40s and the journey went within as well. Atman is a healer. Grace and blessings on your walk now. I find your opening sentence very inspiring – “They say that if you’re not living on the edge, you are taking up too much space”. Fantastic. It is as if you and I share the same mind and are in the same place in life. It is convincing me more and more of the decision I have made and the path I wish to walk down. Great post and blog. I am a new follower and fan! I like the fact you said you will be ‘Trusting” that you will find the way. I believe everyone has an inner voice and it’s important to listen to it. I can empathize with your plight. I’ve been out of work for over a year now, and I can vouch for the fact I feel like I’m spinning my wheels, floating in a purgatory of qualification between “overqualified”, and “not enough experience”. Also, your appreciation for silence mimics my own. Nothing more productive than being alone with yourself to promote productive thinking. Excellent blog, I’ll be watching! Wow, awesome. I too would love to do this pilgrimage – I wish you the best of luck and I look forward to finding out how it goes for you. Haven’t heard from you for a while. You are missed! Hope you have having a wonderful trip! I suggest the Psalms of Ascent as inspirational reading material on your journey. Are you still in Spain? What are you up to? I’m nominating you for an award, the Versatile Blogger award… participate if you wish, I just think that what you have to say is good and I think more people ought to know about you. Namaste. I love this post. I love Paolo Coelho…The Alchemist being my favorite book of all time so I really enjoy the quote. Don’t know what book it’s from, but I love it. I love that you’re heading on that pilgrimage and that you are trying to mentally prepare for it. All your intentions are very inspiring, very AWESOME … the kind of things that I live by on a daily basis and other that need to be posted on my fridge so that I can be reminded every day, but my favorite is “To be present…” that one has made my current happiness project and regular everyday existence a lot better. Great post. Hi, Truth Warrior! This post really resonates with me! I know the feeling of being in a job and it’s all clockwork…a person begins to feel dead…a paycheck..a paycheck…I was there. I worked 50-60hours a week in a job that I hated. Well, that was years ago. They let me go and I moved back to Cali. Since then, I have connected with my passions which is writing and filmmaking. At the time, I didn’t know where my destination would take me. I just knew that the job wasn’t working anymore and I needed to think about my next ‘destination.’ The destination was definitely worth it and I finished my first short film that screened at a theater in SF. We do have options!